Can Rahul Gandhi’s New-Found Religiosity Help Fight Hindutva? 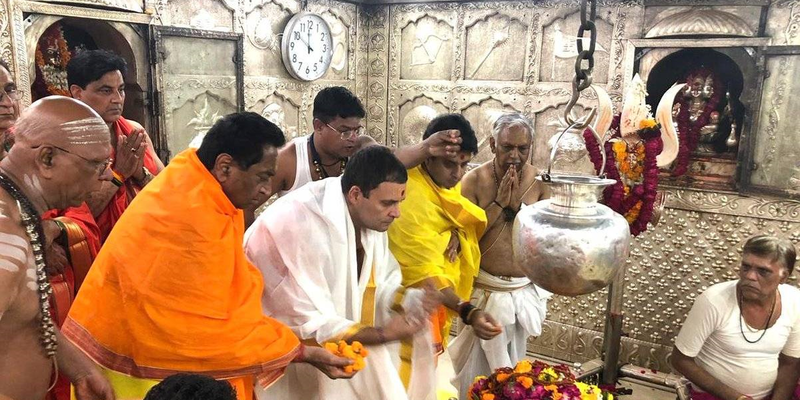 Opponents of Hindutva should encourage Rahul Gandhi’s temple visits and engagement with his Hindu roots, not criticise him for ‘selling out’. Rahul Gandhi’s visits to temples and maths, highlighting his Brahmin lineage, and citing the Gita may or may not have contributed to the Congress’ electoral success in Rajasthan, Madhya Pradesh and Chhattisgarh. But they have triggered a spate of censures by liberal commentators who have labelled it ‘soft Hindutva’ and a betrayal of the party’s historic commitment to secularism, pluralism and an inclusive polity. This criticism is both grossly unfair and wrongheaded. Unfair because Rahul Gandhi has made it amply clear that he and the Congress will have no truck with Hindutva. His unstinted support (against the views of the Kerala party unit) for the implementation of the Supreme Court judgment on Sabarimala is evidence of his continued commitment to a liberal worldview. But it is the wrongheaded notion of secularism – rooted in Nehru’s thinking – underpinning liberal criticism of Rahul Gandhi’s new-found religiosity that needs unpacking. I have no idea how genuine Gandhi’s commitment to his Hindu faith is or whether he is simply playing politics. But if he is serious about engaging with the Hindu tradition and the Hindu community, he has the opportunity to re-invent Indian secularism in a way that is much more rooted and thereby more resistant to Hindutva. 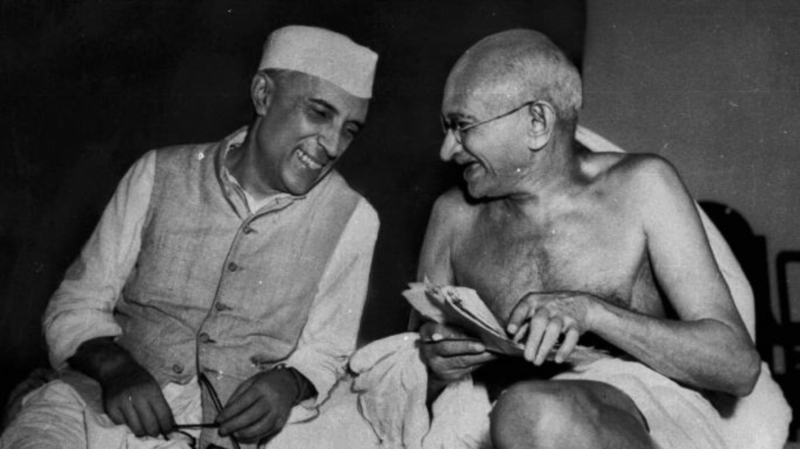 India’s secular ethos was profoundly shaped by Nehru’s strongly-held personal beliefs. Two are particularly relevant. First, given his scientific mindset and rationalist outlook, Nehru had an active distaste for religious observance, particularly Hindu, and could not bring himself to regard the overtly religious as likely to share his liberal values. Perhaps it was his unwillingness to give any quarter to the Hindu right that prevented Nehru, despite his deep knowledge of India’s history of tolerance and the Hindu tradition’s openness and pluralism, from weaving explicitly Hindu strands into his secular narrative (as Gandhi often did). In any event, Nehru’s patronising attitude towards the godly carried over into his secularism which looked askance at religious figures and the visibly devout in public life. Second, largely on account of growing Hindu-Muslim polarisation in the run up to 1947, Nehru correctly and vehemently opposed ‘communalism’ and especially so in the case of the majority Hindu community. But his liberal credo pushed this point too far in treating a unified Hindu identity as solely or at least mostly the product of cultivation by right wing reactionaries. In this, Nehru was undoubtedly influenced by Western scholars who over-played the tradition’s diversity, pluralism, polycentricity and the relative recency of the term ‘Hindu’ to cast doubt on the very existence of a coherent Hindu community. Both these pillars of Nehru’s political philosophy moulded Indian secularism and left a deep impact on Indian left-liberal intellectuals as witnessed in the hostile reactions to Rahul Gandhi’s public displays of piety. They also fundamentally influenced the Congress and the nature of political formations in India. The freedom movement was shot through with Hindu religiosity – in the form of prayers and songs at political gatherings, organisation of festivals and the use of Hindu idioms, particularly by Gandhi – without compromising its secular spirit, and had many devout-yet-secular Hindus in its ranks, most notably Gandhi, but also others such as Rajaji, Vallabhbhai Patel and Rajendra Prasad. But after independence and Gandhi and Patel’s passing, the more religious-minded Hindus such as K.M. Munshi and Purshottam Das Tandon were sidelined within the Congress as Hindu revivalists. The ‘big tent’ of the pre-independence Congress not only shrank as it shifted leftwards in its economics, but also because of its hostility to the religiously-inclined (of course, this did not diminish its enthusiasm for caste-based politicking). By the 1960s, public expressions of Hindu religiosity or engagement with the Hindu community and its concerns became the sole prerogative of the Hindu Mahasabha and its successors on the Hindu right. This left the Congress relatively bereft of vermillion-sporting, puja-performing, saffron-clad, devoutly Hindu senior leaders sympathetic to the concerns of the Hindu community but with an unquestionable commitment to secularism. The Congress even gradually vacated its historic role, dear to Gandhi, in the vanguard of reform within Hinduism – be it untouchability or women’s equality. This cleavage between secularism in the Nehruvian mould and the Hindu tradition created a fertile context for the rise of Hindutva and the growing polarisation in Indian society. By the knee-jerk rejection of any meaningful engagement with the majority religious tradition as anti-minority and inconsistent with secular values, the Congress (and the left and other secular parties) let the right seize the mantle of Hinduism. The right then proceeded to interpret the tradition in a narrow, chauvinist and ahistorical manner, asserting a monopoly on speaking for Hindus. This is the trajectory that Rahul Gandhi must seize the opportunity to correct. His temple visits and keenness for his Hindu roots provide a starting point. For one, Rahul Gandhi needed to ‘neutralise’ the vilification of the Congress as anti-Hindu and Gandhi himself as ‘un-Indian’ on account of his Italian-origin mother, which the BJP has exploited to its advantage for years. Simply staying silent has not worked. Rather, what is clear is that by donning his Hinduism on his sleeve, Rahul Gandhi has unnerved the BJP leadership – as evidenced by their hapless challenges to his caste and gotra credentials and the authenticity of the photos of his Manasarovar pilgrimage. By his example, Rahul Gandhi has underlined that observant Hindus can also be secular and therefore welcome in the Congress: he himself is a ‘Shiv bhakt’ without turning into Adityanath. Consistent with liberalism, Hinduism treats faith as a private matter and salvation as an individual pursuit. Equally, no dogma mandates or approves of a Hindu curtailing the food and personal habits of others. Krishna’s endorsement in Bhagavad Gita 4.11 of multiple religious paths as equally valid is not just some dry philosophical doctrine but reflective of the worldview of most Hindus. 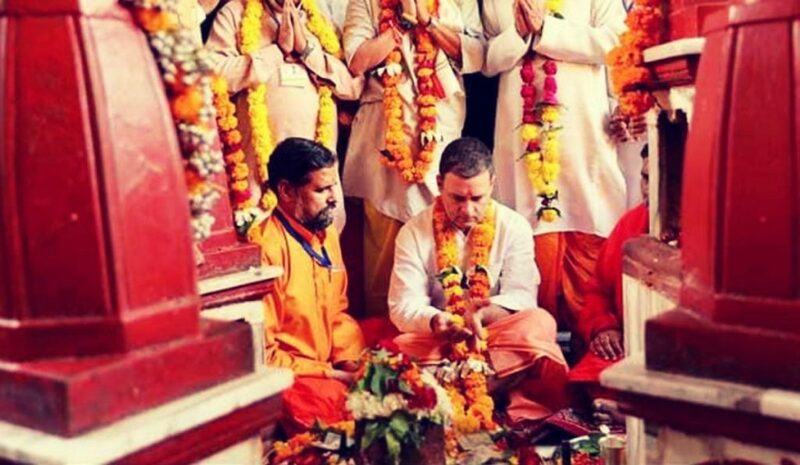 If Rahul Gandhi goes on to visit gurudwaras, mosques and churches – as he should – it would be entirely in keeping with the day-to-day syncretism of the average Hindu. In short, secularism is not the exclusive preserve of the tepidly religious liberal-left nor Hinduism of the rabidly majoritarian right. Nothing in his or her religion mitigates against a devout Hindu being secular in outlook – committed to equal treatment for all regardless of faith and keeping religious influence out of government and the nation’s laws. More fundamentally, Rahul Gandhi has the opportunity to redefine secularism from being an abstract political principle sourced from the 18th century Enlightenment and the European history of church-state relations to one that springs from India’s social, cultural and spiritual life. The Hindu tradition’s historical tendency towards syncretism and eclecticism, a tolerance of difference and acceptance of diversity and hesitation to be too sure about anything are firm underpinnings for a broad-based secular worldview. Hinduism’s robust tradition of doubt and scepticism – traceable as far back as the Nasadiya Sukta of the Rig Veda which famously ends its reflection on creation with the line ‘the creator knows – or maybe even he does not know’; or to ancient seers, who seeking definition in their philosophical speculations, often exclaim: ‘not this, not this’ rather than the certitude of ‘it is this’ – is not only the source of the plethora of contradictions that characterise Hindu beliefs and practices but also provides a particularly rich soil for liberal values to flourish. After all, if one is fundamentally uncertain one can hardly impose one’s views and practices on others, let alone hate or massacre them for their different beliefs. Nehruvian secularism, by distancing itself from the majority faith in our deeply religious country, laid the groundwork for Hindutva. Contra his liberal critics, Rahul Gandhi’s public commitment to his Hindu faith offers a platform to reclaim Hinduism from the clutches of Hindutva and draw on the Hindu tradition to re-shape and strengthen India’s secular fabric. Such an approach is far more likely than the tired platitudes of the liberal-left to lead to an India where citizens are free to live and practice their faiths without fear. 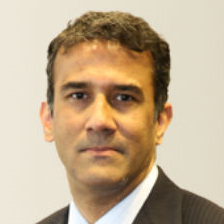 Ramesh Venkataraman is a private equity investor and former McKinsey partner and is on the Board of Governors of the Oxford Centre for Hindu Studies.